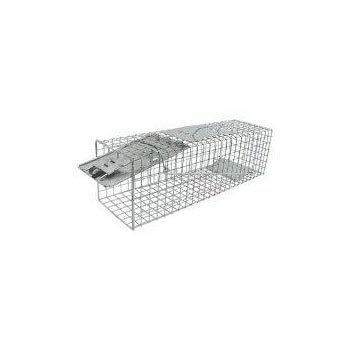 STV have produced the well known defender brand of pest control sytems for a wide range of unwanted guests around your home or work place.This STV071 rabbit cage trap has the new improved design of a newer smooth multi spring mechanism that helps to increase catch rates.Simply place the STV071 rabbit cage trap in your garden, allotment or where you have problems with rabbits, set the trap and when you have captured the rabbit you can relocate to a remote location.This STV071 is easy to store as it comes as a flat pack and is simple to assemble.67 x 24 x 28cm. The Big Cheese Rabbit Cage Trap. New & Improved Model. An innovative and practical cage trap for rabbits and other similar sized animals. EASY TO SET: Single entry door with sensitive footplate trigger mechanism. EASY TO BAIT: Use fresh fruit or vegetables. If you have any questions about this product by STV Big Cheese, contact us by completing and submitting the form below. If you are looking for a specif part number, please include it with your message.